HOLLYWOOD, California, February 29, 2016 (ENS) – Leonardo DiCaprio won the Oscar for Best Actor in a Motion Picture Drama last night for his role as frontiersman Hugh Glass in “The Revenant.” The star used his acceptance speech to draw attention to the hot-button issue of climate change. 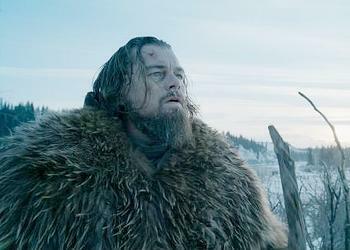 “Making ‘The Revenant’ was about man’s relationship to the natural world. A world that we collectively felt in 2015 as the hottest year in recorded history,” DiCaprio told the Academy Awards audience, after thanking all those involved with the film, an American survival thriller that got the Oscar for Best Picture. “Our production needed to move to the southern tip of this planet just to be able to find snow,” he said. The film was shot in three countries: Canada, the United States, and Argentina. The initial plan was to film entirely in Canada, but the weather proved to be too warm, leading the filmmakers to locations at the tip of Argentina with snow on the ground, to shoot the film’s ending. 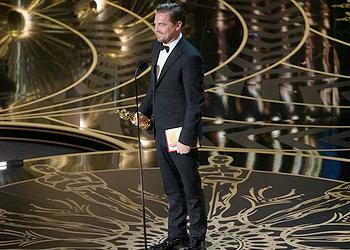 The Oscars are given by the Motion Picture Academy of Arts and Sciences. In the same way, DiCaprio used his acceptance speech at the Golden Globe awards January 10 in Beverly Hills to plead for the life of Planet Earth. “This film was about survival. It was about adaptation. It was about the triumph of the human spirit,” said DiCaprio, accepting the Golden Globe Award, which is given by the Hollywood Foreign Press Association. “I want to share this award with all the First Nations people represented in this film and all the indigenous communities around the world,” DiCaprio said. DiCaprio puts his money where his mouth is. The actor has granted millions to support “the long-term health and well being of all Earth’s inhabitants” through the foundation he established in 1998. The Leonardo DiCaprio Foundation has awarded US$30 million in grants to more than 65 organizations engaged in protecting biodiversity, oceans and wildlands conservation and preventing climate change. DiCaprio sits on the boards of several organizations dedicated to these issues, including: WWF, the Natural Resources Defense Council, Global Green USA and the International Fund for Animal Welfare. In 2007, DiCaprio released “The 11th Hour,” which features over 50 experts on environmental issues and their solutions for saving the planet and humanity. In 2014, United Nations Secretary-General Ban Ki-moon named DiCaprio a UN Messenger of Peace with a special focus on climate change.